Half of my life spent as a Barista was enough to know coffee like the back of my hand. I don’t have to take a sip - Instead, I can simply smell the coffee and tell you how it’s gonna taste. My expertness in this field alone urged me to share my experience to a wider audience. And in this review I share a quick peek into the best French Press on the market - Kona French Press Coffee, Tea and Espresso Maker. The quality of coffee is definitely the biggest reason to choose a French Press over a d﻿rip ﻿c﻿offee maker. After all, none of us would want to spend more time brewing if the resulting cup isn’t the best. However, even among the French Presses, you need to know that there are certain machines that brew the finest-tasting coffee to date. One such brewer is the KONA. Unlike many French Presses I’ve dealt with, the KONA is designed with a tight-fitting screen. As a result, it can effectively filter out all the coffee grounds from entering the coffee it brews. Trust me: You’ll never know the difference it makes until you take a sip. It can also brew loose tea, and keep grounds out - making even the tea-lovers benefit from it. 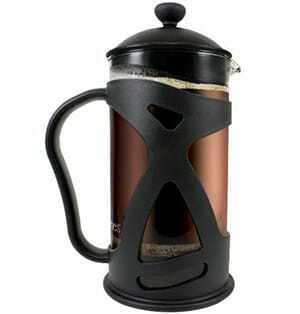 Not only are the looks, but also the feel of this French Press screams quality. What I liked the most, however, is the filtration system. Most French Presses use plastic, and they tend to warp over time. Even worse: They hurt the flavour of fine coffee, and eventually result in affecting your health. But the exceptional KONA French Press comes with stainless steel. Not a single part of its 3-piece filter system is made up of plastic. Meaning: It’s going to be the last thing to give up. Meanwhile, the quality of the glass carafe is worth considering too, for it’s made up of not just any glass - but borosilicate glass. This ensures greater thickness, and longer life in the face of continuous use. It can also survive minor falls, and effectively resist thermal shocks. For some: It’s almost bulletproof. But it doesn’t mean that it’s unbreakable. Washing it when it is still hot, or dropping it from your apartment window will not leave it one piece! French Presses have been on the market for nearly a decade. In my opinion, they look the best when they talk their age. KONA does exactly that. With its vintage design and modern web-like styling, it has the ability to compliment any kitchen - and wherever you choose to make your cup of joe. The glass carafe can be seen in between the web-like frame and its transparency allows you witness the entire brewing process. Its lightweight, along with the solid grip handle, will serve well for outdoor-use as well. Maybe next time you wouldn’t want to consider ditching coffee on your picnic by the lake. If you’re a person who never gets around dealing with a glass carafe, then the KONA French Press is not for you. The glass is thicker and more durable than most - but if not taken proper care, it will eventually break. I didn’t come across any major drawbacks that’ll act as deal-breakers. But: There were a few i believe would be worth noting. Firstly, the lid of the carafe doesn’t fit snugly. It, however, closes the carafe well, but may come off when you pour the coffee into a mug. So make sure you hold the lid while you do it. Secondly, keep in mind that the carafe is not insulated. This is common to all glass carafes, and a not a drawback, actually. So don’t expect your coffee to stay hot for more than 20 minutes. Lastly, it’s not easy to brew coffee for one. This is because the plunger is sort of short, and will not reach all the way down for a single cup. So you’ll either have to pour several cups at once and save for future use, or gulp them down all at once! Brews coffee and tea while keeping grounds out. KONA French Press is by far the best machine I’ve come across. Everything from the groundless coffee it brews to the overall quality and looks is unbeatable for the price. Currently, and for a long time, it is considered the #1 Best-Seller among french presses. KONA French Press is by far the best machine I’ve come across. Everything from the groundless coffee it brews to the overall quality and looks is unbeatable for the price. Currently, and for a long time, it is considered the #1 Best-Seller on Amazon. I am thinking about getting a Kona press but am concerned about your comment that it’s hard to make coffee for one because the plunger doesn’t go all the way down, which I’d do most of the time. I had wanted to get a bigger press though for the occasional guests. Now I’m thinking I may have to just get a Bodum after all. I’m also unable to find out who makes them. It seems the only place they’re available is Amazon and I won’t shop on Amazon. Hello Connie, we are delighted to summarise one of our ‘secrets’ for your interest! You should use a small – 3 cup – french press. This means there is the smallest space left at the base of the glass when the plunger is completely depressed. Then unscrew the filter mechanism and add a 2nd or even 3rd mesh filter – one on top of each other. Why? we discovered that any escaping grounds and sediment are reduced or even eliminated! The mesh screens vary in price considerable, so shop around. Obtain a small portable/battery powered frothing whisk you would use for foaming milk. Now you are all prepared to make the best coffee ever! Place one or two servings of medium grind coffee in the press. Now add the hot water (not boiling) and fill to about two-thirds full. Whisk the coffee for around 10 seconds or longer for increased strength. Push the plunger down fully and serve in a cup, mug, jug or vacuum flask. Now add extra hot water – sufficient for one or two normal size servings as required. Because this process only takes 10 seconds or so, you can empty the press and make a second batch – and a third – and so on in less than one minute! This clever trick speeds up the brewing process and is the same idea that Nespresso have incorporated in their expensive coffee machines which only work with genuine Nespresso capsules – not good! Hope this idea is of value.